Behind a red door near the back of Robertson Plaza, Bibo Ergo Sum is as cheekily enigmatic as its Latin name (“I drink, therefore I am”). The Art Deco interior—brainchild of ArcLight Cinema heir Tait Forman—lends a theatrical feel, while drinks designed by Proprietors LLC (the Normandie Club) sneak twists into familiar tipples. THE SCENE: Sharply dressed couples linger over coupe glasses in a part of town where craft cocktail bars are in tight supply. 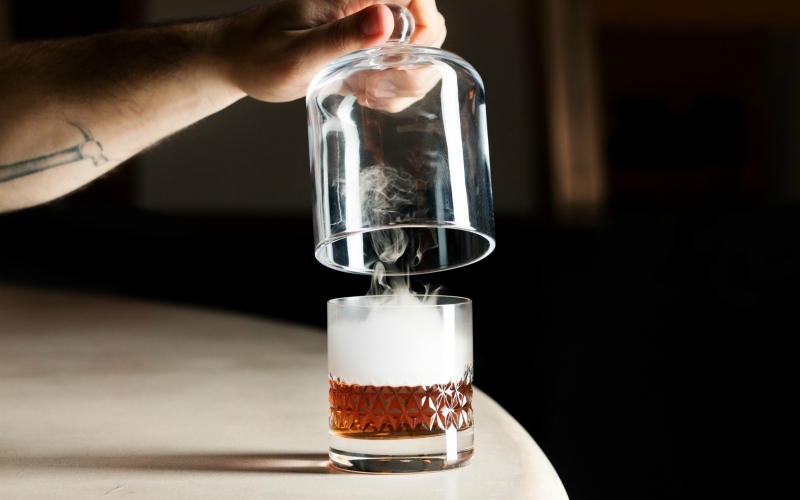 THE DRINKS: Inspired by the film The Prestige, the menu goes for sleight of hand. The Paradise Falls Clubhouse, a white wine spritzer with Bolivian brandy, is garnished with grapes carbonated using dry ice. More than a stirred classic, the Niemeyer’s Martini involves an olive oil-washed gin and white cacao.